Music is your passion. If it were up to you, you’d spend all your time writing and performing. But if music is also your business, you have to leave the studio and do some legwork to promote it. So, we got our Music Liaison here at SoundCloud Reviews to reach out to a few musicians and ask how they market and promote their SoundCloud music. This is what they said. In business, it’s common practice to start by stating your goal, identifying a target market, and then developing a product that fills the needs of that market to reach the goal. As a musician, this strategy is just as important for you as for any CEO. Understand your ideal fans’ personalities as well as their habits. Do they go to clubs or music festivals? Are they more low-key and prefer to hang out at a rooftop bar, or enjoy listening to music with a few friends on a couch in the back room? Do they listen to music while working, working out, relaxing, or hanging out with friends? As a musician, chances are that how you consume your music is similar to how your potential fans like theirs. The important thing is to have these questions asked and answered, so you know how to best target people when you put your music out there. Attend shows by similar local artists, or look at the profiles of followers for those artists online. If you already have a small fan base, survey your listeners to find out more about them, and ask them how they found you. Look around on forums for people who like music like yours, and join the conversation. Explore YouTube videos of bands in your genre, and see what people say in the comments. Take a look at what other bands are associated with you, and then see if any of them are playing in your area anytime soon. Go mingle with their fans! Ultimately, you should be able to create what is known as a marketing persona. This is simply a template which sums up the profile of your average listener. You always want to be as detailed as possible – to the point where if you can use your research to build yourself a fictional “average fan,” and give him or her a name, you’re golden. Once you know who your target market is, you can start targeting them where they are. This leads to the next point: Where is your target market, both online and offline? Once you know more about who your potential listeners are and their habits and demographics, you can figure out where they are looking for music. The best part about looking online is that platforms are often social so you can not only see what your potential fans like, but also where they live, what activities they do, and how they interact with the web. Dig around for data, because the more you have, the better you can target. Your fans may also follow tastemakers. DJs were the original tastemakers in the world of popular (and alternative) music, but more and more bloggers are taking over that role. Look around for bloggers, online DJs, and even playlist curators. For example, YouTube promo channels may function as tastemakers for your niche, as well as subreddits like https://www.reddit.com/r/GarageRock/ or https://www.reddit.com/r/DeepHouseDaily/ (there’s a subreddit out there for everything). If you want to target people in a certain area, you go to that area and look around. When you’re online, this gets much more complicated – and that’s where analytics and data come in. The easiest way to get data on SoundCloud is to go Pro. SoundCloud places upload restrictions on free accounts, and doesn’t let artists access any data. That changes with Pro, as you get more upload time as well as usage and traffic data. If you can afford the $7 or $15 price, this is one of the easiest ways to gather listener data. If you don’t want to pay for SoundCloud pro, or if you’re just looking for another way to access data, then you can always use the analytics dashboards of YouTube or Google Analytics. YouTube will only give you data about your YouTube channel, but this can be valuable because you can see what else your fans listen to, and how much of your songs they hear. YouTube can be useful for more granular song insights, but a drawback is that it’s only good for YouTube. You’ll only be learning about fans on YouTube, not your fans on the internet at large. Similar to YouTube is Google Analytics. This is one of the most powerful free analytics programs out there, and if you set it up on your website, you can get endless insights from it. Google Analytics can tell everything from where your listeners are, to their age to their interests. This is very valuable data when you’re planning out anything from your next release to your next tour, but the same constraints exist as with YouTube: Google Analytics will help you on your website, and no place else. Twitter and Facebook also have their own analytics platforms, too. If you’re social media savvy or have the manpower, use every social media site you can. You’ll target more people, gather more data, and ultimately be more effective when planning out your next moves. Once you have prepared your promotional materials for influencers and fans, you are ready to use all that. You’ve set your goals, identified potential targets, and gathered data. Now it’s time to take to the (social) streets. As mentioned above, if you’ve got the savvy and the manpower, you should be on social media. That doesn’t mean that you should be on all of them, and that doesn’t mean that you should pick one and hang out on it just because it’s Facebook/Twitter/Instagram/whatever. Pick a social media platform that you’re comfortable on, but where your potential fans are, too. One of the great things about SoundCloud is how friendly it is to other social media sites. SoundCloud allows you to link your website, but also to Facebook, Twitter, Tumblr, YouTube, and Instagram. This way, you can be active on social media, while letting your SoundCloud profile be your main base. Use your social media to drive engagement. Ask questions, make polls asking what your next album should be titled, crack jokes, and ask for shares, retweets, and reposts. Harner some organic buzz with hashtags and behind-the-scenes pics. Make use of free downloads, discounted merchandise, tickets to gigs, and other incentives. Offer these in exchange for email sign-ups or as rewards for remix contests. Engage people. Hold contests, offer giveaways or meet-and-greets, or backstage passes for your next gig. Basically, if you were your ideal fan, how would you want an artist to reach out? Social media is a great tool for growth. You can talk directly with your fans! For every hour you spend outside going to gigs and meeting fans in person, spend an hour online to get to know people better. The more people you talk to, the more fans you’ll get! You’ve done planning, and you’ve started creating buzz online. Awesome! But before you blow up, you’ll need to build yourself up with some numbers. It’s easy for a quality artist to get lost in the sea of any social media platform because he doesn’t have a following already. This doesn’t mean that his music isn’t good, it just means that when people see tracks with low play counts, reposts or comments, they’re more likely to judge quickly and hit Next. Buying plays, in small increments, throughout this entire process will help. By doing this, you make sure your new traffic doesn’t fall on an empty profile. Buying social proof as you promote yourself makes it look to your potential fans like you’re growing organically – and will push them to follow you, too. And this doesn’t just mean buy plays, followers and reposts. For the best results, give yourself a social boost across all your social media to become a true online sensation. This is a trick that many musicians have used before, and if it’s done correctly (meaning, at the same time as a bigger plan like the one we’ve outlined so far), it will work. This is one of the reasons we built this site – so you don’t have to worry about being scammed or buying spam. We’ve gone through and tested SoundCloud marketing companies. You can read our reviews here, and know that we stand by each one of our recommendations. Once you’ve got some organic buzz happening as well as a good online marketing company backing you up, you’re ready to reach out to the guys with the big guns. Remember that part about tastemakers, way up in #2? Well, it’s time to bring that out now. Practically all artists that have made it big, cannot say that they’ve done it alone. Across the board, there was a point between the artist making great music and being boosted by fans … and then getting picked up by someone. That “someone” is a tastemaker, whether it’s a producer who used a track in a sample, or a radio DJ, a blogger, a curator on Reddit, a YouTuber, or an A&R. There’s no end to tastemakers, either online or off. Do your research. Who are they? Do they play music like yours? Does your music appeal to their listeners? Can you offer incentives, like tickets to a gig? Do you have a press kit ready, so you can send over your logo? Once they pick up on your name and head to your SoundCloud to check you out, they’ll see people talking on social media, your music, and a growing fan base. It all comes full circle. Your online music presence starts and ends with SoundCloud, and just like you can’t neglect your presence elsewhere, you can’t neglect your SoundCloud. Once you’ve found your niche and are starting to grow, it’s time to reach out. SoundCloud is the best way to do that. Follow others. It can be another artist whose music you like, or it can be a fan who might love a follow back. Following others can be a great way to expand your network, even though it’s slow. Who knows, you might even find another artist who’s interested in collaborating down the road! Leave comments. That does not mean spam! SoundCloud has an awesome comments feature, and gives you an opportunity to jump into conversations with other artists and potential fans. Use this feature to get people to your page – but be careful not to just hop in, insert a link, and leave. That will backfire. Join groups. Try to join groups that are either geographically focused or genre-based. If you are a musician in Portland, Oregon, then join groups like “Portland, Oregon,” or “Portland Music.” If you are an electronic musician, join groups like “Electronic Music World.” This can be another great way to meet not just potential fans, but other artists, too. Create a marketing plan that lays out your goals, so you know what success looks like. Know where your target market is by looking around and getting a solid idea of who your potential fans are. 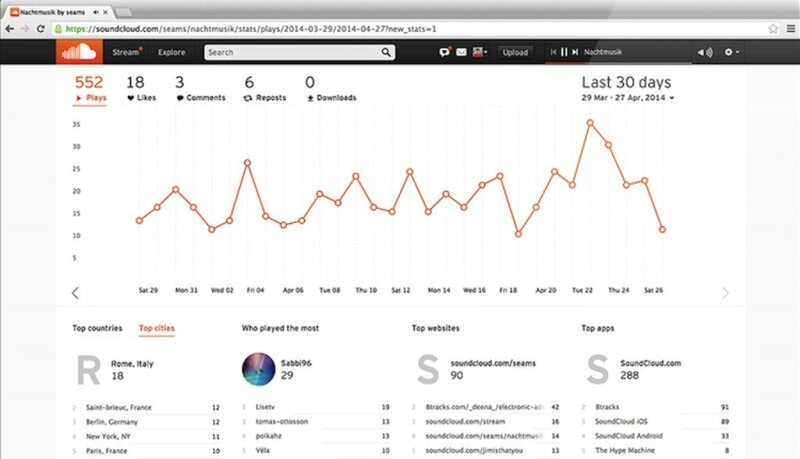 Get into the data with SoundCloud Pro, Google Analytics, and other analytics platforms on social media. Promote your music on social media so you can start creating organic buzz online by engaging fans. Use a SoundCloud marketing company to get you your initial dose of social proof, so your online profiles look good to your potential new fans and tastemakers. Reach out to tastemakers once you’re ready to blow up. Wanna make it big? Get your music to the ears of those who already have followings. Work SoundCloud some more and close the loop. More and more, online artists are made by SoundCloud, so make sure you’re always there. If you take these steps and proactively promote your tracks to the right listeners, you will succeed. It will give you the social proof you need to persuade both listeners and influencers that you are worth their time.